On paper, the pairing perplexed. Paul Simon, one of pop music's pre-eminent craftsmen, joining forces with Sting, a polished, multi-platinum superstar at the other end of the sonic spectrum. 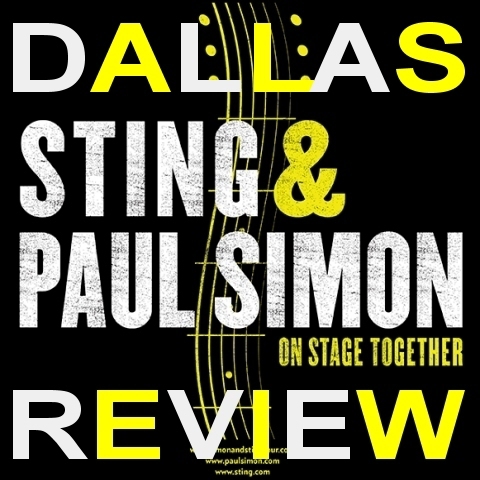 Once the shock receded a bit, similarities emerged - each embraces a polyrhythmic songwriting style, both are intimately familiar with world music and, if nothing else, Simon and Sting could commiserate about leaving high-profile bands and striking out on their own. So, it was with guarded optimism a sizable crowd poured into the American Airlines Center Sunday night (about 25 percent of the upper deck was curtained off), for only the second performance of the "On Stage Together" tour. In practice, the pairing pleased - and surprisingly so. Over the course of 30 songs and nearly three hours, the two men swapped verses on well-known hits and established an ebb-and-flow rhythm that made the evening seem like a particularly well-sequenced iTunes playlist. After a few songs together, one or the other would exit, leaving whoever was left to perform a mini solo set. "So, we've entered into an adventure," Simon said, not long after taking the stage. "How will we blend two extraordinary bands and two different styles?" The night was devoted to finding out. Split down the middle, song-wise, each man got about 15 songs to showcase, with the highlights being the 10 tunes they performed, well, "On Stage Together." Hearing Simon sing verses of Sting's Fields of Gold was discombobulating, just as was hearing Sting's spin on The Boxer. Their voices didn't always blend seamlessly - Sting's husky tenor occasionally overpowered Simon's thin baritone - but there were a few moments, particularly during The Boxer, which were absolutely breathtaking (the pair's harmonizing on the indelible line "I am leaving, I am leaving/But the fighter still remains" raised goosebumps). The contrast between them - Sting's jazz-inflected austerity and Simon's earthy ebullience - helped sustain the show during some of its duller stretches, particularly as it ticked past the two-hour mark. However odd the union seemed, its benefits were evident. Sting seemed far less willing to coast than on his 2011 "Back to Bass" tour, and Simon redoubled his efforts to shake up his back catalog (for instance: all but scatting You Can Call Me Al). That sort of creative competition is healthy, especially for two artists who could easily coast on a greatest hits tour, which "On Stage Together" avoids being simply because of its novelty. Hopefully, the marketplace isn't flooded with knock-offs ("Jackson Browne and Elton John: On Stage Together! "), but if more puzzling pairings pop up in the near future, it won't be a mystery as to why. 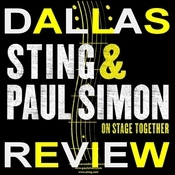 For more reviews from the Dallas show please visit http://www.sting.com/tour/index/date/id/2909 where you can view the setlist, leave your comments about the show, post images of your ticket stub and your photos from the show!